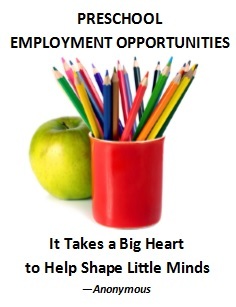 His Growing Grove Child Care Center is looking for both preschool teachers working with 4/5 and infant-toddler teachers. These teachers will be working in tandem with other staff and Lead Teacher. Qualified teachers with at least 12 ECE units including 6 ECE Infant/Toddler units and two years experience working with infants and toddlers. Please submit your resume and a cover letter detailing why you would like to join our team at His Growing Grove or stop by for an application. Contact Carrie Barbaria at (510) 581-5088.